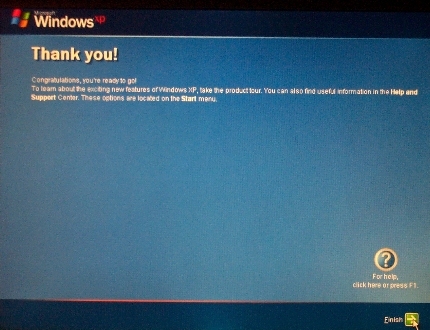 The next screen will prompt you to activate Windows. 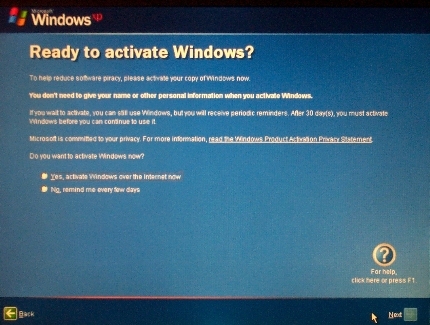 Activation is mandatory with Windows XP, but you have 30 days to do it. 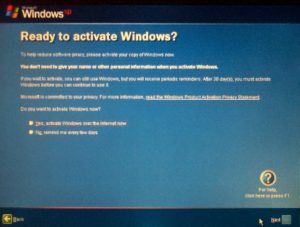 You can activate over the Internet, or you can telephone Microsoft to activate. You will have the option to choose whether or not to activate by clicking a ‘Radio’ button for Yes or No. We recommend you select No and move on by clicking the Next icon at the bottom of the screen. A Radio button is a selection choice a bit like choosing a radio station by pressing one of a selection of buttons. Any selection cancels any previous selection. This screen will allow you to set up from 1 to 5 users to use the computer, by typing a username for each user. Each user will have their own individual configuration including personalised desktop, personal folders and other settings. Click the Next icon to continue to the next screen. 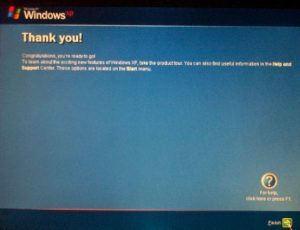 This last screen simply confirms that your initial configuration is complete, and the icon at the bottom of the screen is titled Finish. Once this initial configuration is carried out, the computer will take you to the desktop. 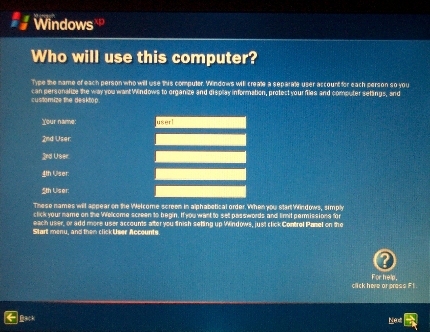 you get to the desktop you will be presented with a screen with the names of the users and a unique icon for each. Click on a user name or icon to go to the desktop for that user.